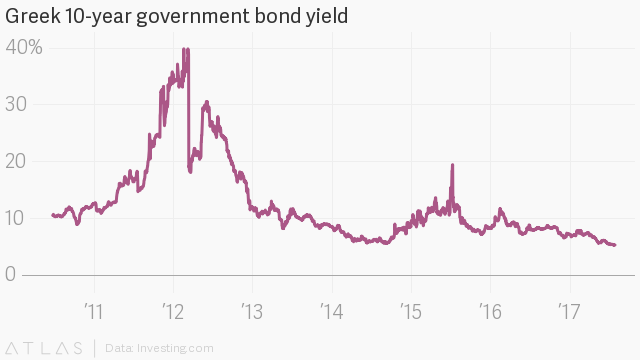 For many investors, the phrase “Greek bonds” makes them break out in a cold sweat. Greece’s spectacular economic collapse was at the center of the euro zone’s sovereign debt crisis and just a few years ago private bondholders were hit with huge losses on Greek debt, which was forcibly restructured as part of the country’s multibillion-euro bailout. Bad times. And yet, today there was a healthy appetite for the first Greek bond issue in three years: Athens sold €3 billion ($3.5 billion) in five-year government bonds. Demand for the debt exceeded €6.5 billion. That’s right, Greece had to turn away investors. Greece! Greece’s prime minister, Alexis Tsipras, said the bond issue was “the most significant step to finish this unpleasant adventure.” The debt was priced with a yield of 4.625%, lower than the initial guidance given by the government. That’s much higher than bonds of similar maturities by other euro-zone borrowers (yields move inversely to prices), but a better rate than countries such as Mexico and Iceland. In early 2014, Greece also sold a batch of five-year bonds after being shut out of markets for a few years. These bonds were priced at a 4.95% yield, also lower than was expected at the time. Greece’s then-prime minister Antonis Samaras similarly hailed the sale as a success and said it was a “decisive step” out of the country’s crisis. In fact, it marked the start of yet more chaos. Nine months later, Samaras lost power to a Tspiras’s left-wing populist party and by August 2015, Greece had signed up to another international bailout deal, this one worth €86 billion over three years. What gives? Are investors’ memories that short? Have they forgotten Greece’s rotten credit ratings and status as the only developed nation to miss a repayment to the IMF? Have they forgotten the hair-raising bond-yield rollercoaster of the past few years? Despite its troubled past, Greece is now taking advantage of the general enthusiasm about the euro zone’s economic recovery. The region’s better-than-expected growth is helping balance out a US and UK slowdown, the IMF said. Currency traders are the most bullish on the euro in six years. Last week, S&P changed the outlook on Greece’s junk-rated debt to positive, which is something. All of this even though Greece’s economy grew by just 0.01% in 2016 and suffers under strict austerity measures demanded by creditors, an unsustainable debt pile, and a 20%-plus unemployment rate, by far the highest in Europe. Nonetheless, according to many it is a good time for Greece to return to the capital markets. The European Central Bank’s bond-buying program is still supporting the markets. Analysts expect GDP growth of around 2% this year. The political situation is (marginally) less fraught, with the coalition government likely to survive until the next scheduled election in 2019. There are also signs that Greece might finally get much needed debt relief. Last week, the IMF gave approval to contribute to €1.6 billion to Greece’s aid, but only if European creditors agree to reduce the country’s debt load. The Greek government is now funded through 2019, and just unlocked another €8.5 billion from its bailout program. As part of the bond sale today, the state also offered to buy back bonds that due in 2019, further reducing funding strains in the near future. About half of the investors in the new bonds also sold the old bonds in exchange at a premium. Today’s action may also be a sign of how desperate investors are for bonds with higher yields, amid years of central banks suppressing returns. After all, last month Argentina—a serial defaulter on debt—was able to find buyers for 100-year bonds (paywall). That makes the rush to get more Greek debt seem less bold by comparison.